The Council for Advancement and Support of Education (CASE) selected John Brown University as a winner of CASE’s 2012 Educational Fundraising Awards in the categories of Overall Performance and Sustained Excellence. Of the 1,011 eligible institutions, JBU was one of six universities to receive an award in Overall Performance and one of ten universities to be given an award in Sustained Excellence. According to CASE, JBU was selected to receive the Educational Fundraising Awards in Overall Performance and Sustained Excellence based on the overall quality of the fundraising program, the innovation of the program, the use of resources and the program’s impact on the university’s alumni, parents, students, faculty and staff. The Sustained Excellence in Educational Fundraising Award recognizes the few fundraising programs that have garnered a CASE Award for Educational Fundraising in either Overall Performance or Overall Improvement in three of the last five years. In addition to receiving a Sustained Excellence award in 2011, JBU previously received awards for Overall Performance in 2008, 2009 and 2011. CASE is one of the largest international associations of education institutions, serving more than 3,400 universities, colleges, schools and related organizations in 68 countries. This year, CASE received more than 2,500 entries for consideration in 41 categories by 614 member higher education institutions, independent schools and nonprofits from around the world. CASE is the leading resource for professional development, information and standards in the fields of education fundraising, communications, marketing and alumni relations. 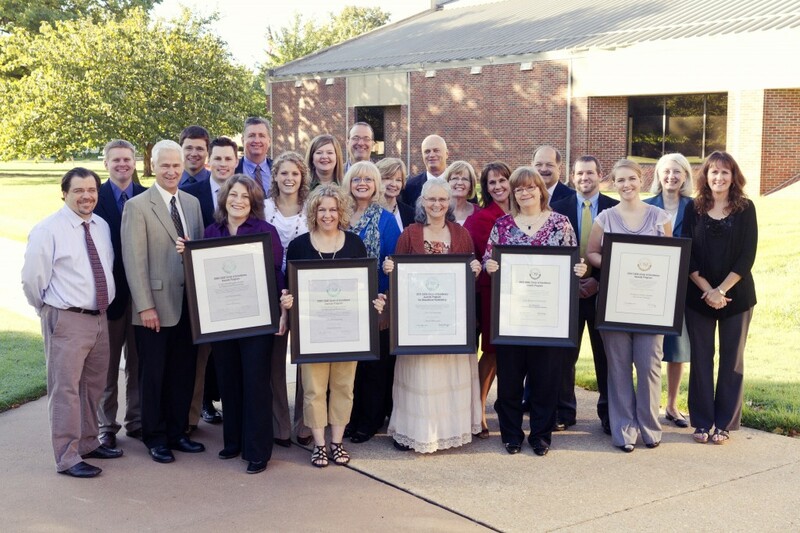 Photo Caption: The John Brown University Advancement staff with the five CASE awards. Front row left to right: Lucas Roebuck, Jerry Rollene, Joyce Fiet, Kerry Pruett, Sherry Miller, Sonya Price, Jessa Eldridge and Lori Gryder. Second row: Ken Leonhard, Eric Greenhaw, Johanna Musgrave, Darla Grimm, Judy Bethke, Kris Anderson, April Moreton, Mark Hard, Eric Walter and Susan Nece. Back row: Matt Snyder, Jim Krall, Rachel Fiet, Jim Evans and Steve Onnen.